Artificial intelligence (AI) offers unprecedented opportunities to improve the way underwriters select, target and price risk. Insurers that integrate emerging technologies and new sources of data will gain a competitive edge by way of improved loss ratios, innovative products, and a more efficient workforce. What practical steps can insurers take to prepare for the age of bionic underwriting? 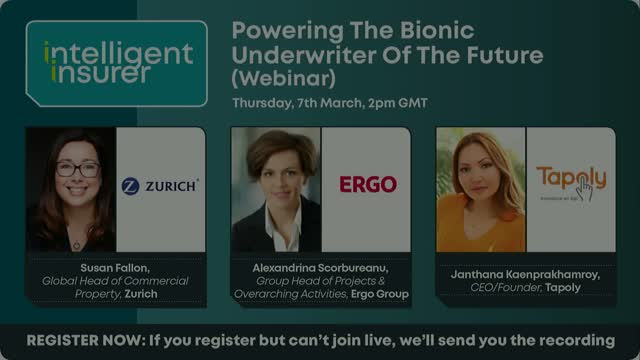 Join Intelligent Insurer as they talk to Zurich, ERGO and Tapoly about leveraging artificial intelligence to power the bionic underwriter of the future. Less than two years ago, the majority of Insurtech startups were focused on developing propositions for personal lines. Most aimed to disrupt or displace conventional distribution channels, with digital products and services that made the purchase of insurance quick, simple, and more user-friendly than ever before. Facing a market saturated by innovation for personal lines, ambitious Insurtechs are now clamouring to crack the commercial market. With solutions being developed to address the challenges of underwriting complex and specialty risk, 2018 is widely tipped to be the year of commercial Insurtech. Join Intelligent InsurTECH Europe in association with Oxbow Partners, as they discuss why Insurtech matters for corporate and specialty insurers. How can cognitive technologies, automation and robotics pragmatically transform the claims process for insurers? Recorded live at Intelligent InsurTECH Europe this panel discussion made up of leading industry experts examines how technology will transform the claims process for insurers. Join insurtech experts from Sapiens, Generali, Metlife and MAXIS GBN and Tryg Insurance at Data Tech Talks during Intelligent InsurTECH Europe as they discuss how your company can use data analytics to optimise customer engagement and retention. Magdalena Ramada Sarasola, Senior Economist at Willis Towers Watson, discusses blockchain from an insurance perspective. Recorded live at Intelligent InsurTECH Europe this presentation examines present trends in blockchain, future developments and how quickly your business could see the benefit of this technology. Automation is set to drastically change the way insurers operate in the coming years. One particular area for disruption of current practices is the automation of claims. In this video, filmed at Intelligent InsurTECH Europe 2017 we brought together three industry experts to share their experience and knowledge on how providing a user-friendly, automated claims model can help a business win and retain customers. Join a panel of insurtech experts discussing the most important issues facing insurance startup investment and engagement today, as recorded at Intelligent InsurTECH Europe 2017. •How to generate entrepreneurship within organisations / build ambitious insurtech startups: opportunities and challenges. •How can incumbents and startups use each other’s capabilities in an optimal way to ensure a successful partnership? •Investing to innovate: what’s interesting based on the 3 P’s (profitability; persistency - keeping the customer longer; proximity - to the customer); how and when to invest; global investment trends; re/insurance giants’ recent startup investment & partnerships. •Tracking commercially viable startups / solutions emerging around the world & qualifying potential investments. •What startups need to know about investors - the do’s and don'ts & best practices both worlds can share. •Is it possible for Europe to compete against Asia, when we look at the regulatory environment? •Looking into the near future - where will innovation come from? How to keep up with newcomers delivering optimisation and automation quicker through partnership models. Join an expert panel of insurtech influencers as they debate the most important issues facing insurance boardrooms today. The videocast starts with a keynote address from Brian Wallace, Chief Technology Officer - Insurance, DXC Technology at Intelligent InsurTECH Europe 2017. The speech focuses on how insurtech is creating innovation and how current insurers can adapt and transition to deal with these changes. Following this is the keynote panel from the Intelligent InsurTECH Europe 2017 event, which brings together some of the greatest minds in the industry discussing a wide range of issues and challenges conventional insurers face in the insurtech space while expanding on the points made in Brian Wallace’s keynote address. •Which insurtech solutions can help insurers differentiate themselves and bring unique competitive advantages to the business? •How will insurtech impact the core business, results, portfolio, new clients and profitability? •What are the benefits compared to the current operations? •How much will it cost? What’s the potential ROI and impact on the bottom line? Why should the board approve the investment? •Where do the real opportunities lie? Where should insurers focus on: the connected car; the connected home; the connected self? •How to attain scalability; what are possible opportunities and pitfalls? •The pressure to remain competitive: How much time do we have, if any? •Recent initiatives and implementation case studies. Intelligent Insurer is a leading magazine, website and event organiser focusing on the needs of the re/insurance industry. Our channel seeks to provide concise and manageable content about the most important discussion points re/insurers face today. In the coming weeks and months this channel will bring a wide range of webinars and pre-recorded content from our live events to give you unparalleled insight into the latest industry developments.